Climate change is more complex than daily temperature readings. In a recent Tweet, US President Donald Trump suggested that the cold temperatures throughout the east coast show that global warming isn’t happening. It’s not the first time that Trump has tried to debunk climate change, and it speaks to widespread misconceptions. 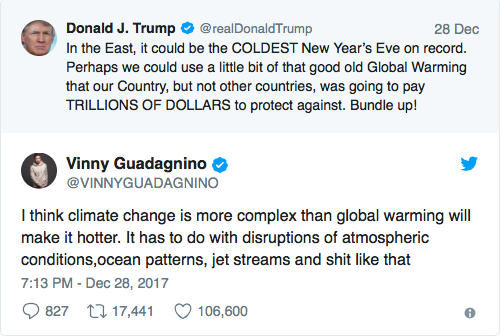 In fact, none other than The Jersey Shore’s Vinny Guadagnino tried to correct the president. The unexpected exchange is a reminder that climate change is more complex than daily temperature readings. As the Northeast braces for a “monster” snow storm, and millions of people are chilled to the bone, it might be tempting to think that climate change assertions are overblown. But here are three reasons, courtesy of the Environmental Defense Fund, why the current weather not only doesn’t disprove the theory of climate change, but supports it. As ice melts from rising global temperatures, more moisture is absorbed by the atmosphere, leading to more precipitation. 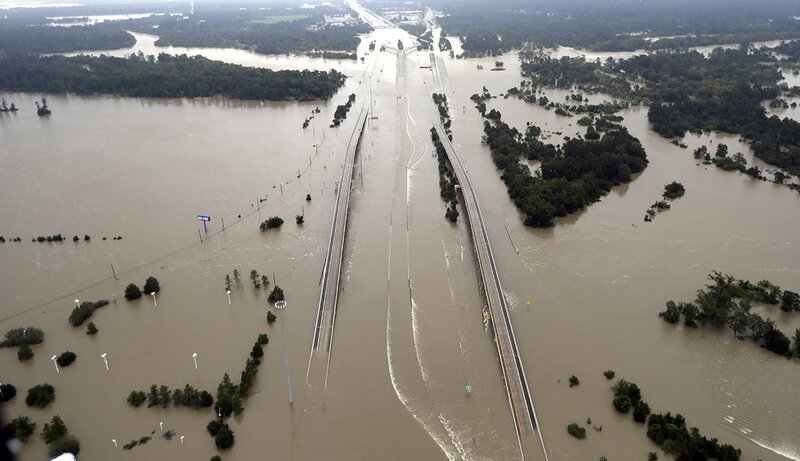 Recently, scientists have argued that increased moisture may have caused the record-breaking rainfall during Hurricane Harvey. Similarly, the blockbuster storm about to strike Eastern states is likely fed by increased atmospheric moisture. 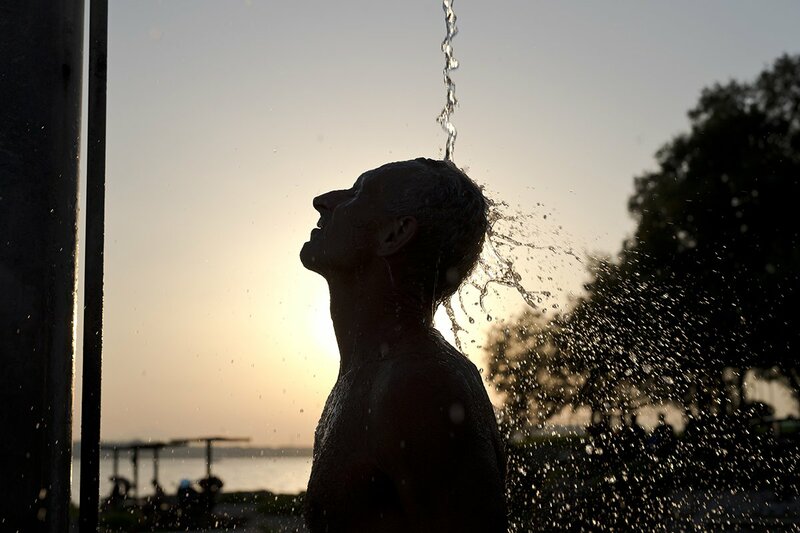 Since 2000, 16 of the 17 hottest years in recorded history have occurred. This trend of warming can be seen across past decades as well, according to EDF. Consequently, people have gotten used to warmer temperatures year-round, including during winter months, and end up feeling cold weather more intensely. 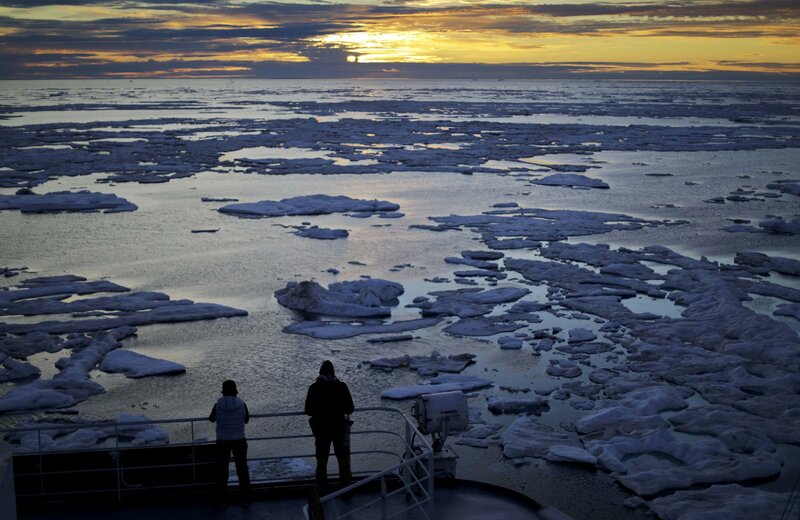 Plus, a cold snap doesn’t disprove the fact the world is getting warmer. As the US faces below-average temperatures, the rest of the world is actually warmer than average. Rising temperatures have caused the Arctic to shrink 7.4% every decade since 1979, an average decrease of 28,000 square miles every year. All of this melting ice is releasing cold air into the atmosphere that could be entering the jet stream that reaches the eastern US, leading to colder temperatures. Global Citizen campaigns on the Global Goals, which call for effective climate action. You can take action on this issue here.